Valentina Tereshkova was the first woman in space, orbiting the earth forty-eight times in Vostok VI in 1963. She orbited the Earth for almost three days, showing that women have the same ability in space as men. Later she toured the world promoting Soviet science and feminism. She also served on the Soviet Women's Committee and the Supreme Soviet Presidium (government committee). Valentina Vladimirovna "Valya" Tereshkova was born on March 6, 1937, in the Volga River village of Maslennikovo. Her father, Vladimir Tereshkov, was a tractor driver. He had been a Russian Army soldier during World War II (1939–45; a war fought mostly in Europe that pitted Great Britain, France, the United States, and the Soviet Union against Italy, Germany, and Japan). He was killed during the war when Valentina was two. Her mother Elena Fyodorovna Tereshkova was a worker at the Krasny Perekop cotton mill. She single-handedly raised Valentina, her brother Vladimir, and her sister Ludmilla in economically trying conditions. Valentina helped her mother at home and was not able to begin school until she was ten. Tereshkova later moved to her grandmother's home in nearby Yaroslavl, where she worked as an apprentice at a tire factory in 1954. In 1955 she joined her mother and sister as a loom operator at the cotton mill. Meanwhile, she took correspondence courses (courses taught through the mail) and graduated from the Light Industry Technical School. An ardent communist (believer that there should be no private property), she joined the mill's Komsomol (Young Communist League) and soon advanced to the Communist Party. In 1959 Tereshkova joined the Yaroslavl Air Sports Club and became a skilled amateur (nonprofessional) parachutist. Inspired by the flight of Yuri Gagarin (1934–1968), the first man in space, she volunteered for the Soviet space program. Although she had no experience as a pilot, her achievement of 126 parachute jumps gained her a position as a cosmonaut (Russian astronaut) in 1961. At the time the Russian space program was looking for people with parachuting experience, because cosmonauts had to parachute from their capsules after they came back into Earth's atmosphere. Five candidates were chosen for a onetime woman-in-space flight. Tereshkova received a military rank in the Russian air force. She trained for eighteen months before becoming chief pilot of the Vostok VI. All candidates underwent a rigorous (difficult) course of training, which included tests to determine the effects of being alone for long periods, tests with machines made to create extreme gravity conditions, tests made to duplicate the zero gravity weightless conditions in space, and parachute jumps. for her to master rocket techniques, study spaceship designs and equipment, but she tackled the job stubbornly and devoted much of her own time to study, poring over books and notes in the evening." At 12:30 P.M. on June 16, 1963, Junior Lieutenant Tereshkova became the first woman to be launched into space. Using her radio callsign (nickname) Chaika (Seagull), she reported, "I see the horizon. A light blue, a beautiful band. This is the Earth. How beautiful it is! All goes well." 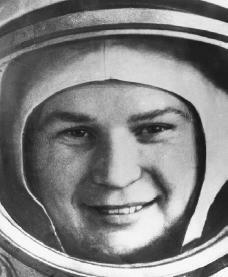 Tereshkova was later seen smiling on Soviet and European TV, pencil and logbook floating weightlessly before her face. Vostok VI made forty-eight orbits (1,200,000 miles) in 70 hours, 50 minutes, coming within 3.1 miles of the previously launched Vostok V, which was piloted by cosmonaut Valery Bykovsky. By comparison, the four American astronauts who had been in space before this flight had a combined total of thirty-six orbits. Tereshkova's flight confirmed Soviet test results that women had the same resistance as men to the physical and psychological stresses of space. In fact, tests showed that women could actually tolerate G-forces (gravitational forces) better than men. Upon her return Tereshkova and Bykovsky were hailed in Moscow's Red Square, a large plaza in Moscow used for official celebrations. On June 22 at the Kremlin she was named a Hero of the Soviet Union. Presidium Chairman Leonid Brezhnev (1906–1982) decorated her with the Order of Lenin and the Gold Star Medal. A symbol of the liberated Soviet woman, Tereshkova toured the world as a goodwill ambassador, promoting the equality of the sexes in the Soviet Union. She received a standing ovation at the United Nations. With Gagarin, she traveled to Cuba in October as a guest of the Cuban Women's Federation and then went to the International Aeronautical Federation Conference in Mexico. Unfortunately, Tereshkova and the other female Russian cosmonauts were not taken as seriously inside the Soviet Union as they were outside. The Russians used the female cosmonauts for publicity purposes to show how women were treated equally in their country. In truth, however, they were never thought of as the equals of the "regular," that is, male, cosmonauts, and they never received the same quality of flight assignments. On November 3, 1963, Tereshkova married Soviet cosmonaut Colonel Andrian Nikolayev, who had orbited the earth sixty-four times in 1962 in the Vostok III. Their daughter, Yelena Adrianovna Nikolayeva, was born on June 8, 1964. Doctors, who were fearful of her parents' space exposure, carefully studied the girl, but no ill effects were found. Tereshkova, after her flight, continued as an aerospace engineer in the space program. She also worked in Soviet politics, feminism, and culture. She was a deputy to the Supreme Soviet between 1966 and 1989, and a people's deputy from 1989 to 1991. Meanwhile, she was a member of the Supreme Soviet Presidium from 1974 to 1989. During the years from 1968 to 1987, she also served on the Soviet Women's Committee, becoming its head in 1977. Tereshkova headed the USSR's International Cultural and Friendship Union from 1987 to 1991, and later chaired the Russian Association of International Cooperation. Tereshkova summarized her views on women and science in an article titled "Women in Space," which she wrote in 1970 for the American journal Impact of Science on Society. In that article she said, "I believe a woman should always remain a woman and nothing feminine should be alien to her. At the same time I strongly feel that no work done by a woman in the field of science or culture or whatever, however vigorous or demanding, can enter into conflict with her ancient 'wonderful mission'—to love, to be loved—and with her craving for the bliss of motherhood. On the contrary, these two aspects of her life can complement each other perfectly." Valentina Tereshkova still serves as a model not only for the women of her native country, but for women throughout the world who wish to strive for new goals. Lothian, A. Valentina: First Woman in Space. Edinburgh: Pentland Press, 1993. O'Neill, Lois Decker. "Farthest Out of All: The First Woman in Space," in Women's Book of World Records and Achievements. Garden City, NY: Doubleday/Anchor Press, 1979, pp. 739–740. Sharpe, Mitchell R. "It Is I, Sea Gull": Valentina Tereshkova, First Woman in Space. New York: Crowell, 1975. Great lady, who show the world that women can do everything. Cosmonaut Valentina Tereshkova, a great woman of the world. She has done a wonderful job. Many many congratulations to their country for making people such a great position. Congratulations Russia.